September 16, 2011 – PKD was named one of OBJ’s “Golden 100″ – Top Privately Held Companies in Central Florida at today’s 27th annual awards celebration luncheon. 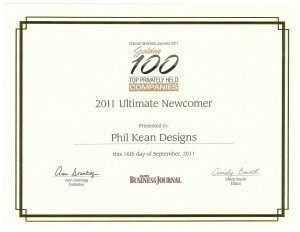 In addition, the OBJ recognized PKD as one of their “2011 Ultimate Newcomers”. Recognized for consistently delivering home owners with prestigious residences and luxury interior design within the grand state of Florida and throughout the world.